Tickeri.com now provides hard tickets with several security features! We love our online system, but we know our clients also need hard tickets to sell at their venues, promotion team and different locations in their area. Need 50 tickets or 50,000? Tickeri works with all size of orders and can also create different types so you can easily differentiate tickets such as General Admission and VIP tickets. Tickeri.com has one the best prices and quickest turnaround in the industry. 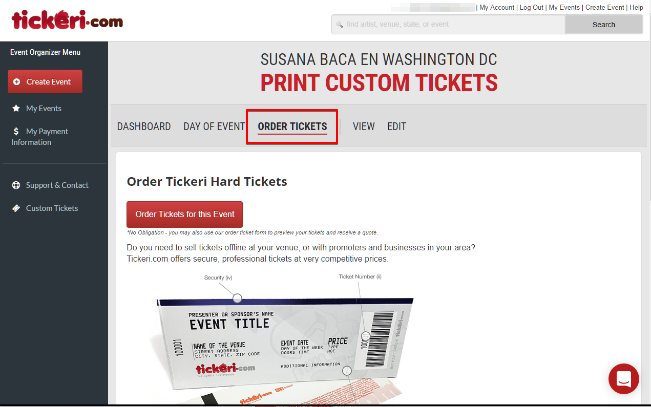 Find out why 1000’s of tickets are printed daily and used by many event producers and venues. Ready to order some tickets? After creating your event, visit your event dashboard and select the Order Tickets tab in order to see samples and get a free quote. © 2011-2017 Tickeri LLC. All Rights Reserved.